Also directs the Ryan abortion training program at the University of New Mexico. May also work at Planned Parenthood Albuquerque Surgical Center abortion clinic. 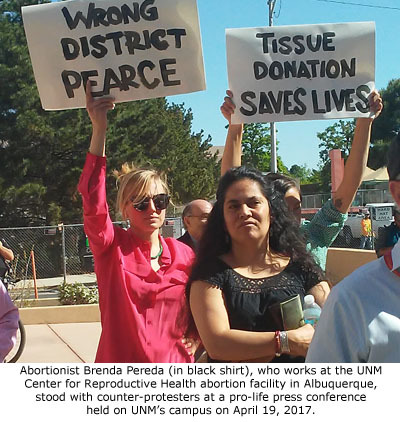 New Mexico AG “Aggressively” Seeking Documents from UNM and Late-term Abortion Business in Criminal Investigation, 4/21/2017 State of NM, medical license verification - Brenda Pereda (search by name) State of NM, controlled substance license verification - Brenda Pereda (search by name) State of MI, license verification - Brenda Pereda UNM Ob/Gyn Dept. Annual Report 2012-2013 - Brenda Pereda is director and instructor for the Ryan Training Program in abortion training. See pages 18-24. UNM Health System physician profile - Brenda Pereda, MD - Works at UNM Center for Reproductive Health abortion clinic UNM Ob/Gyn faculty list - Fellow, Brenda Pereda, MD UNM Abortion Training and Opt-out Policy - Abortion training locations include UNM Center for Reproductive Health abortion clinic UNM "Pregnancy Alternatives" - UNM advertises their abortion clinics Bedsider Providers membership - Brenda Pereda, Fellow in Family Planning at UNM HealthGrades.com - Brenda Pereda, MD - Office locations at UNM Center for Reproductive Health and San Mateo Blvd Planned Parenthood abortion clinic. Doximity.com - Brenda Pereda, MD, education and credentials Vitals.com - Brenda Pereda, MD, office locations - Moon St. address is old location of UNM Center for Reproductive Health abortion clinic. NPI #1255519435 - Brenda Pereda, MD BetterDoctor.com - Brenda Pereda, MD profile NOTE: Brenda Pereda appears to have no middle name. Her Michigan medical license application file shows no middle name. See documents below. Expired Michigan medical license for Brenda Pereda, MD. 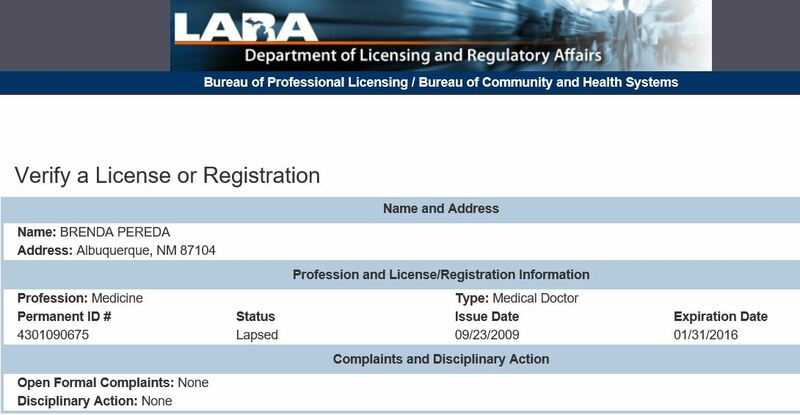 NM medical license application file for Brenda Pereda, MD. Note NO MIDDLE NAME is shown on document. MI medical license application file for Brenda Pereda. Note NO MIDDLE NAME is shown on document. Anika Durr sues defendants including Brenda Pereda, after she underwent a C-section, but a surgical sponge was left in her abdomen. "Plaintiff, ANIKA DURR, underwent surgery to remove a foreign body that was found to be a retained gauze covered in a purulent substance, which caused several complications including adhesions, injury to her bowel requiring surgical intervention." See pages 7-8. Patient Laravian Sawyer sues defendants including Brenda Pereda after her bowel was perforated during a laparascopy, causing complications. See pages 3-6. Defendants include: Curtis Boyd, Carmen Landau, Shannon Carr, Univ of NM, Lisa Hofler, Lily Baydat, Brenda Pereda, & Lauren Dvorscak. Case history for court case involving Brenda Pereda. Court case info. Note: Brenda Pereda is not named in this document. Lawsuit info for two cases in Wayne County, MI. Details on abortions and abortion training at UNM clinics. Dr. Brenda Pereda is Director of the Ryan Training Program in abortion training. As a Family Planning Fellow, Dr. Pereda also teaches in the Ryan abortion training program. See details on pages 18-24. UNM "Pregnancy Alternatives" sheet. Advertising flyer for abortion clinics including UNM Center for Reproductive Heath. UNM abortion training and opt-out policy. Gives details on abortion training sites including UNM Center for Reproductive Health. 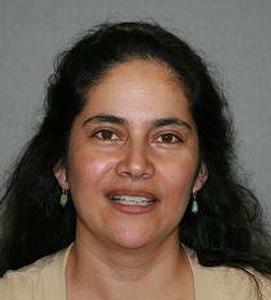 Dr. Brenda Pereda received Medicaid payments for 14 abortions in 2013, at a total cost of $1.999.96. Statistics compiled by Project Defending Life, based on public records from the NM Dept. of Health.